Vintage Stout Embossed Metal 7up Sign > Antique Old Soda Pop Cola 8622. Vintage embossed metal 7up sign. This sign has deep beautiful color. It would make a great addition to your sign collection. It measures 19.5" x 14" wide. 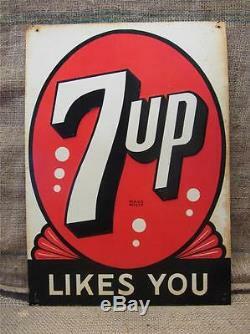 7up Likes You Stout Sign Company St. Louis Mo Made in USA. It is in good condition with minor dents. It has moderate to severe areas of discoloration and minor to moderate scratches, see pictures. See description above for further info on the condition. The item "Vintage Stout Embossed Metal 7up Sign Antique Old Soda Pop Cola 8622" is in sale since Friday, October 17, 2014. This item is in the category "Collectibles\Advertising\Soda\7 UP".